American Mars lander. Mars lander based on surplus hardware from the cancelled Mars Surveyor 2001 and the failed Mars Polar Lander (whence the Phoenix designation). Mars Lander built by University of Arizona (Science); Lockheed Martin Space Systems (Spacecraft) for NASA, USA. Launched 2007. Status: Operational 2007. First Launch: 2007-08-04. Last Launch: 2007-08-04. Number: 1 . Gross mass: 680 kg (1,490 lb). The planned landing location was in the north of Mars, at Vastitas Borealis. The spacecraft consisted of a cruise stage, aeroshell for re-entry, backshell for protection of the lander, parachute system for braking the lander after re-entry, and liquid propellant rocket system for a soft touchdown on the surface. The lander was equipped with a robotic arm, soil analysis instruments, meteorology instruments, and cameras. The Phoenix mission was the first chosen for NASA's Scout program, an initiative for smaller, lower-cost, competed spacecraft. 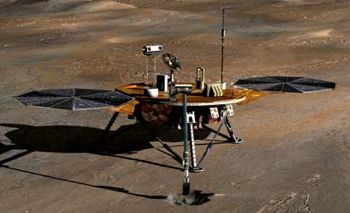 Named for the resilient mythological bird, Phoenix used a lander that was intended for use by 2001's Mars Surveyor lander prior to its cancellation. It also carried a complex suite of instruments that were improved variations of those that flew on the lost Mars Polar Lander. Phoenix was to land on the icy northern pole of Mars between 65 and 75-north latitude on 25 May 2008 . During the course of the 150 Martian day mission, Phoenix would deploy its robotic arm and dig trenches up to half a meter into the layers of water ice. These layers, thought to be affected by seasonal climate changes, could contain organic compounds necessary for life. The probe would follow a 10 month Hohmann minimum-energy trajectory to Mars, and make a direct reentry into the Martian atmosphere. This technique maximized payload, but was riskier since there was no phase of a Martian parking orbit to ensure that all was ready prior to landing. The cruise phase lasts for approximately 10 months as Phoenix makes its way to Mars. Up to six trajectory correction maneuvers were planned. During the last two weeks before Phoenix entered the Martian atmosphere, NASA's Deep Space Network would track the spacecraft even closer than earlier in the mission. The results would be used to radio to the spacecraft commands for two final trajectory correction maneuvers in the last three days before reentry into the Martian atmosphere. Five minutes before Phoenix entered the Martian atmosphere, the cruise stage would be jettisoned. At 125 km above the surface, Phoenix would begin Martian atmosphere entry. Antennae located on the backshell would allow continuous communications via one of three spacecraft already orbiting Mars. After the lander had decelerated to Mach 1.7, a parachute would be deployed. Shortly thereafter the heat shield was jettisoned, the landing radar was activated, and the lander legs were extended. The lander continued through the Martian atmosphere until it comes within 1 km of the surface. At this point, the lander would release the parachute, throttle up its landing thrusters and decelerate to a soft landing. At an altitude of 12 m or a descent speed of at 2.4 m/s, the spacecraft begins a constant velocity descent. The landing engines are shut down off sensors located on the footpads of the lander detect contact with the surface. To analyze soil samples collected by the robotic arm, Phoenix carried an "oven" and a "portable laboratory." Selected samples were to be heated to release volatiles that could be examined for their chemical composition and other characteristics. Imaging technology inherited from both the Pathfinder and Mars Exploration Rover missions were implemented in Phoenix's stereo camera, located on its 2-meter mast. The camera's two "eyes" would reveal a high-resolution perspective of the landing site's geology, and also provide range maps that would enable the team to choose ideal digging locations. Multi-spectral capability would enable the identification of local minerals. Phoenix would also scan the Martian atmosphere up to 20 kilometers in altitude, obtaining data about the formation, duration and movement of clouds, fog, and dust plumes. It carried temperature and pressure sensors. Robotic Arm (RA): Built by the Jet Propulsion Laboratory, the RA was critical to the operations of the Phoenix lander and was designed to dig trenches, scoop up soil and water-ice samples, and deliver these samples to the TEGA and MECA instruments for detailed chemical and geological analysis. Robotic Arm Camera (RAC): Built by the University of Arizona and the Max Planck Institute, the RAC was attached to the Robotic Arm (RA) just above the scoop. The instrument provided close-up, full-color images of the Martian surface, prospective soil and water-ice samples, collected samples in the RA scoop, and the floor and side-walls of the trench to examine fine-scale texturing and layering. Surface Stereoscopic Imager (SSI): Built by the University of Arizona, SSI would serve as Phoenix's "eyes" for the mission, providing high-resolution, stereoscopic, panoramic images of the Martian arctic. Using an advanced optical system, SSI would survey the arctic landing site for geological context, provide range maps in support of digging operations, and make atmospheric dust and cloud measurements. Thermal and Evolved Gas Analyzer (TEGA): Built by the University of Arizona and the University of Texas, Dallas, TEGA was a combination high-temperature oven and mass spectrometer instrument that scientists used to analyze Martian ice and soil samples. Small amounts of soil and ice would be delivered into eight tiny ovens. The oven temperature would increase and the power would be monitored. The gases that were boiled out of the sample would be piped to a mass spectrometer for chemical analysis. This process would give important information about the chemical character of the soil and ice. Microscopy, Electrochemistry, and Conductivity Analyzer (MECA): Built by the Jet Propulsion Laboratory, the University of Arizona, and the University of Neuchatel, MECA was a combination of several scientific instruments including a wet chemistry laboratory, optical and atomic force microscopes, and a thermal and electrical conductivity probe. By mixing small amounts of soil in water, MECA determined important chemical properties like acidity, saltiness, and composition. Looking through a microscope, MECA examined the soil grains to help determine their origin and mineralogy. Needles stuck into the soil determined the water and ice content. Mars Descent Imager (MARDI): Built by Malin Space Science Systems MARDI played a key science role during Phoenix's descent to the Martian arctic. Beginning just after the aeroshell was jettisoned at an altitude of about 8 km, MARDI would acquire a series of wide-angle, color images of the landing site all the way down to the surface. Meteorological Station (MET): Built by the Canadian Space Agency, MET would record the daily weather of the Martian northern plains using temperature and pressure sensors, as well as a light detection and ranging (LIDAR) instrument. With these instruments, MET would play an important role by providing information on the current state of the polar atmosphere and how water is cycled between the solid and gas phases in the Martian arctic. Family: Mars lander. Country: USA. Launch Vehicles: Thor, Delta, Delta 7925, Delta 7925-9.5. Projects: Mars. Launch Sites: Cape Canaveral, Cape Canaveral LC17A. Bibliography: 2, 6777, 12949. 2007 August 4 - . 09:26 GMT - . Launch Site: Cape Canaveral. Launch Complex: Cape Canaveral LC17A. Launch Pad: SLC17A. LV Family: Thor. Launch Vehicle: Delta 7925-9.5. Phoenix - . Mass: 680 kg (1,490 lb). Nation: USA. Agency: NASA. Class: Mars. 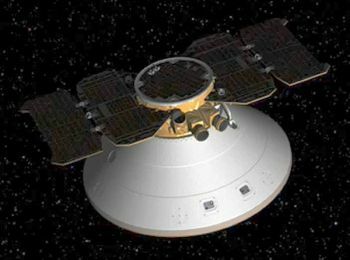 Type: Mars probe. Spacecraft: Phoenix. Decay Date: 2008-05-25 . USAF Sat Cat: 32003 . COSPAR: 2007-034A. Mars lander based on surplus hardware from the cancelled Mars Surveyor 2001 and the failed Mars Polar Lander (whence the Phoenix designation). The planned landing location was in the north of Mars, at Vastitas Borealis. The spacecraft consisted of a cruise stage, aeroshell for re-entry, backshell for protection of the lander, parachute system for braking the lander after re-entry, and liquid propellant rocket system for a soft touchdown on the surface. The lander was equipped with a robotic arm, soil analysis instruments, meteorology instruments, and cameras. 2008 May 25 - . Mars Phoenix landed on Mars - . Spacecraft: Phoenix. The spacecraft successfully landed at 23:38 GMT at the edge of the expected landing area in the Mars polar region of Vastitas Borealis. It was the first successful soft landing outside of the earth since the 1970's (excepting touchdowns on asteroids or comets).